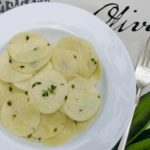 A simple recipe for pasta with a butter-thyme sauce. Bring a large pot of water to a boil. While waiting for the water to boil is when you can remove the thyme leaves from the stems and lightly chop them. Cook the pasta according to the package instructions. While the pasta is cooking, melt the butter in a small skillet over medium heat. When the butter starts to bubble, add the thyme and reduce the heat to medium-low. Cook for 3 minutes and remove from the heat. Be careful not to over-cook or else the thyme will be fried and crispy. You want only to infuse the flavor of thyme in the butter. Drain cooked pasta and transfer to a large pasta bowl. Pour butter-thyme sauce over pasta and stir to combine. Serve immediately. Options for toppings to this recipe: toasted pinenuts or walnuts, parmesan cheese, fresh cracked pepper, chicken, and/or shrimp. *Unsalted butter can be substituted. Add salt to taste.